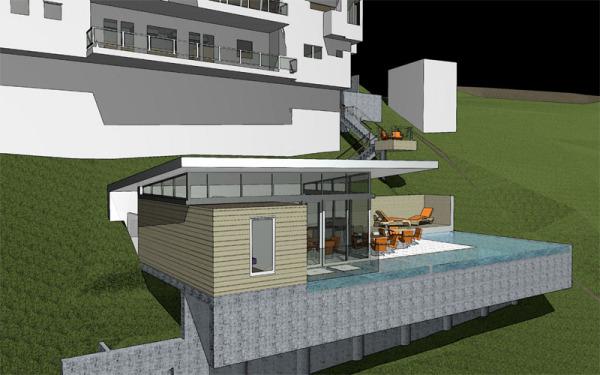 When a successful young professional came to Modative about adding a pool and pool house to his property in the Hollywood Hills, we thought it was a pretty straight forward request. That was, of course, until we saw the property in person.The existing modern home which sat at street level was immediately followed by a steep 45 degree downslope. 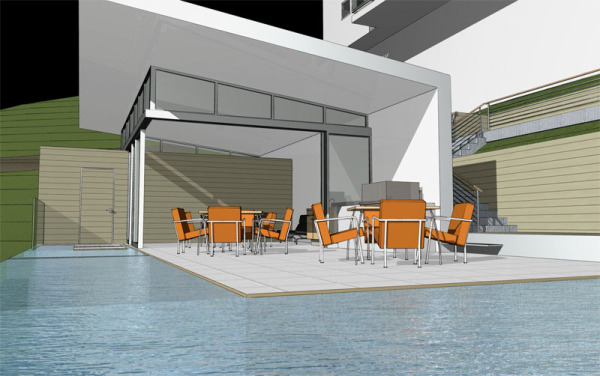 As a site for a pool, it was not ideal, but as we enjoy a good challenge; we saw this as an opportunity to design a dynamic solution that would provide the client's request for valuable outdoor space in an unlikely place. The client had few requests, but one was that the pool pavilion be pretty well hidden from the house above. Our solution was to landscape the roof having it appear as an extension of the sloping side. This green roof not only helps disguise the building from above, but reduces runoff, heat island effect, and provides insulation to keep the pavilion cool in summer months. The steep slope also provided difficult solar challenges. 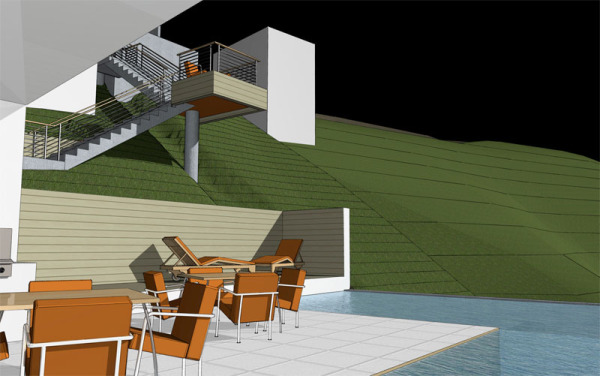 To discover the optimal location for the pool, Modative did thorough computer solar simulations with numerous schemes, eventually settling on a pool and deck location that get the most sun possible. 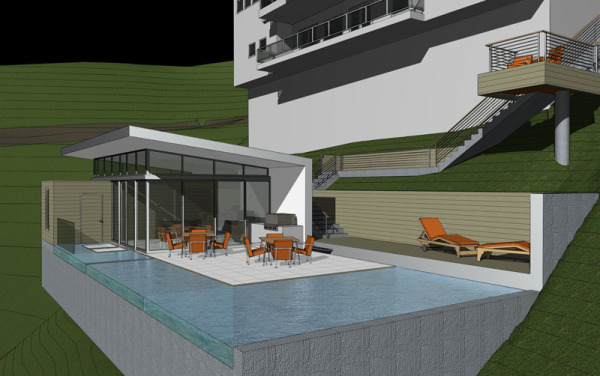 The pool is designed with an infinity edge that floats over the drop off allowing for uninterrupted views from the dramatic hillside location. The main space of the pool pavilion is designed for flexibility. Multi-track sliding doors pull back at the corner, opening up the room to the outdoors. The pavilion's wood-clad bathroom was given equal attention. Accessed via stepping pads in the pool, the bathroom also takes in the view from it's oversize shower. Because of the intensity of the slope, the pool was located several flights of stairs below the house. Resting points, viewing platforms and changes in direction help compensate for the long vertical journey from the house down to the pool. 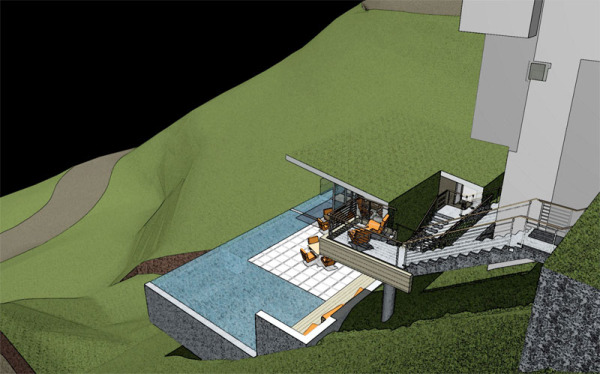 The main view point along the stair, a projecting landing, was envisioned to double as a DJ booth for parties.